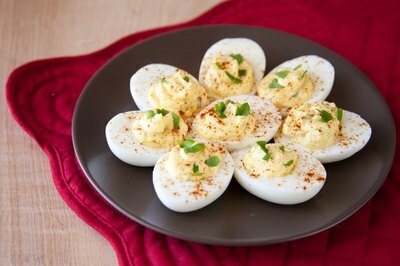 Hard-boiled eggs are used in recipes, such as deviled eggs, or can be eaten alone. Peeling the shell off the cooked egg is a challenge when parts of the egg white are removed along with the shell. This affects presentation and wastes part of the egg. Proper techniques used during and after the boiling process result in a delicious hard-boiled egg that remains intact when peeled. Fill a medium-sized cooking pot two-thirds of the way with water. Drop in 1 tsp. 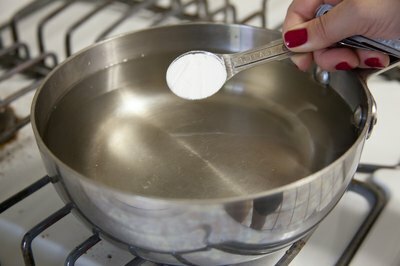 baking soda and stir until the baking soda is dissolved in the water. 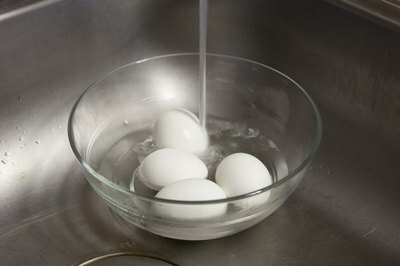 Place the eggs in a single layer in the cold water. Stick a thermometer into the water so you can ensure the water doesn't get too hot. Heat the water until it's between 170 and 180 degrees Fahrenheit. Continue to cook the eggs at that temperature for 10 minutes. Remove the pot from the heat. Use a slotted spoon to remove the eggs and place them in a bowl. Fill the bowl with enough cold water to cover the eggs then allow the eggs to sit in the cold water until the shells are cool to the touch. This prevents the eggs from continuing to cook inside even after being removed from heat. 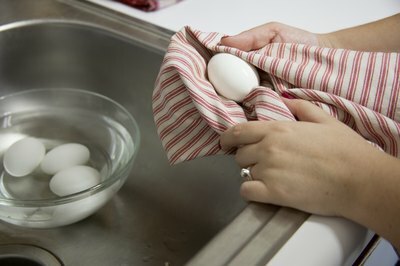 Dry the eggs with a kitchen towel and store them in the refrigerator. 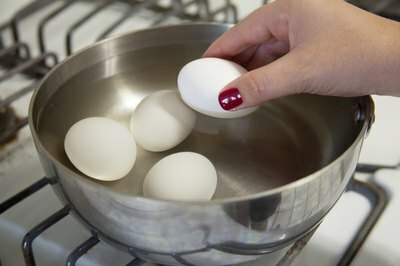 Layering eggs in the pot causes uneven cooking. Egg yolks with green coating around the surface have been cooked too long. Reduce cooking time to prevent discolored egg yolks. Eggs must be stored in the refrigerator to avoid going bad. Egg dishes sitting outside at a picnic or cookout longer than a few hours should be discarded, as spoiled eggs are a health hazard. Use fresh eggs for poaching and other egg-cooking techniques. Older eggs are better-suited to hard-boiling.